There was a time when lustrous black Tahitian pearls were called “Pearls of Queens” due to their scarcity. These Tahitian black pearls are some of the most popular semi precious gemstones because of their unique color and because they have a shinier luster. Today, you can easily buy a set of brilliant Tahitian pearls because they are being cultivated in the beautiful, turquoise water of the Polynesian lagoons. In this article, you will learn everything you need to know about Tahitian pearls and how to buy them. They use this term only for Tahitian black pearls that are of local provenience from oysters (the Pinctada Margaritifera). 80% of the surface of the pearl has to display a continuous layer (nacre) and the nucleus or its seed must not be visible. 20% or more of the pearl surface does not have a normal pigmentation. The pear’s surface if dull, lacking luster. A half or more of the pear’s surface displays deep imperfections. A half or more of the pearl’s surface shows deep and shallow imperfections. 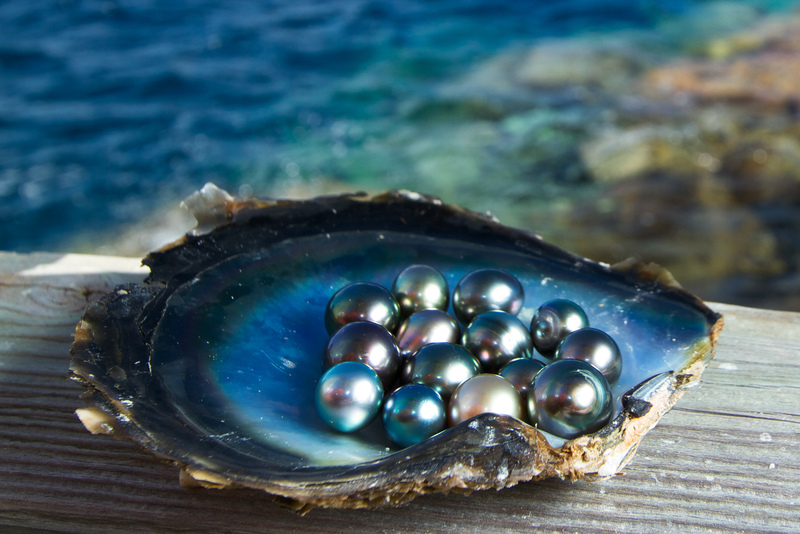 The Polynesian Government has developed their own system for grading the Tahitian black pearls, as well as other types of salt-water-pearls, such as the South Sea Pearls. A Black Tahitian Pearl can have a rating from A to D. Any pearl with a grade under D will not get approval for export and will probably become pearl powder. Tahitian pearls are not only black and they can vary in color. Different sizes, shapes, and colors of pearls appear in special farms. Imperfect pearls do not make it to the market. Tahitian pearls receive grades depending on their diameter, shape, and the coating quality. Pearls are sorted depending on their size. They do this selection by passing the pearls through a set of sieves. Most pearls have a diameter between 8 and 14 millimeters. Just a few get to have a diameter between 16 and 18 millimeters. The record for the biggest black pearl is a pearl with a diameter of 21 millimeters. You can find the largest baroque (~26,95 mm) at the Musse de la Perle From Papeete. All pearls with a diameter bigger than 18 millimeters get an “A” rating, indifferent of their color. Even though you may know them as Tahitian black pearls, they can have a wide range of blackish hues body colors, all natural. The difference shades depend on the amount of black pigment the oyster secrets. The more pigment an oyster produces, the blacker the pearl will be. The varying shades result from the refraction of light that passes through the numerous coating layers of the pearls, which act as a prism. It is the same principle as in the rainbow which is the result of light passing through the raindrops. You can choose a set of Tahitian black pearls with a color ranging from soft gray to deep black. You can also find sets with brown, green or blue colors. Muddy colors are less popular, but for some, they are just as beautiful. Generally, the darker pearls are the most valuables. The body color of the Tahitian black pearls is generally enriched with at least one overtone. The most exquisite pearls can have a peacock green overtone. You would have to pay even twice as much for a pearl set with greenish luster. The next best pearls have silver, blue, pink, gold and aubergine overtones. The industry has given specific names to these overtone colors. Experts recommend that you choose a set of Tahiti pearls the color that looks best on you, taking into consideration the tone of your skin, color of your hair and usual wardrobe colors. Other people advise you to choose what’s fashionable in your region or country. You will also have to take into consideration the price of the pearls, which vary depending on the color. For example, eye-catching multi-colored pearl necklaces are popular in French Polynesia. Round pearls. These have an almost sphere shape with less than 2% diameter variation. Semi-round pearls. Here the diameter variation is between 2% and 5%. Baroque pearls. These pearls can have four shapes: pear, oval, button, or drop. Baroque pearls must have at least one axis of rotation. Circle pearls. These pearls have only one axis of rotation and have regular rings, grooves or streaks that are perpendicular to the axis. Tahitian pearls are very precious and an average-quality small pearl can cost for up to $100. Perfect round black pearls with a diameter of 18 millimeters can sell for up to $10.000. It is up to you to choose the Tahitian pearls that match your personality and style. For more information about jewelry, read our other articles as well. To see Ana Luisa’s unique fine jewelry collections, visit our online jewelry shop.